The iPad 2 may not have many buttons and switches on its outside, but it still has a lot of hardware features. From those buttons to the small openings on various parts of the tablet to key features inside the device, the iPad 2 has a lot going on. To unlock the full potential of what you can do with the iPad 2, you need to know what each of these buttons, switches, ports, and openings are and what they're used for. 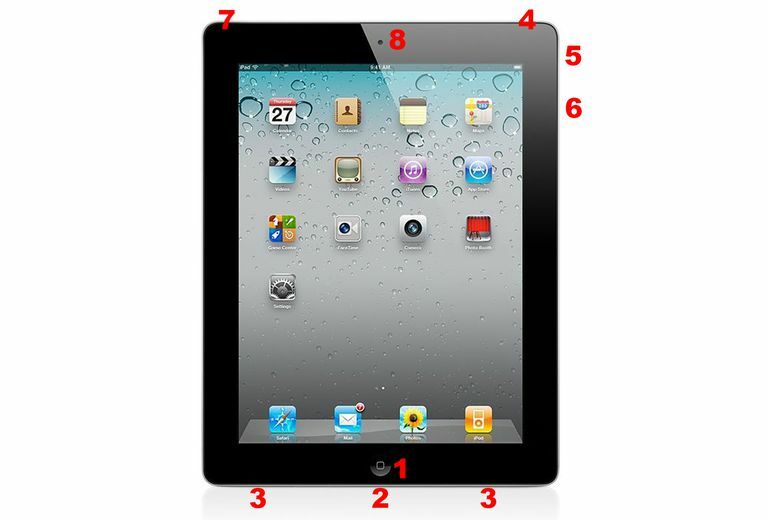 The features present on each side of the device are explained in this article, since knowing what each item is will help you to use and, if necessary, troubleshoot your iPad 2. The iPad 2 has been discontinued by Apple. Here's a list of all the iPad models, including the most current. Home button. Press this button when you want to exit an app and return to your home screen. It's also involved in restarting a frozen iPad and rearranging your apps and adding new screens, as well as taking screenshots. Dock Connector. This is where you plug in the USB cable to sync your iPad to your computer. Some accessories, like speaker docks, are also connected here. Speakers. The built-in speakers on the bottom of the iPad 2 play music and audio from movies, games, and apps. The speaker on this model is larger and louder than on the first-generation model. Hold button. This button locks the iPad 2's screen and puts the device to sleep. It's also one of the buttons you hold to restart a frozen iPad. Mute/Screen Orientation Lock Button. In iOS 4.3 and up, this button can serve multiple purposes depending on your preference. Adjust settings to use this switch to either mute the volume of the iPad 2 or lock the orientation of the screen to prevent it from automatically switching from landscape to portrait mode (or vice versa) when the orientation of the device is changed. Volume Controls. Use this button to raise or lower the volume of the audio played through the speakers at the bottom of the iPad 2 or through headphones plugged into the headphone. This button also controls playback volume for accessories. Headphone Jack. Attach headphones here. Front Camera. This camera can record video at 720p HD resolution and supports Apple's FaceTime video calling technology. Antenna cover. This small strip of black plastic is found only on iPads that have 3G connectivity built in. The strip covers the 3G antenna and allows the 3G signal to reach the iPad. Wi-Fi-only iPads don't have this; they have solid gray back panels. Back Camera. This camera takes still photos and video at VGA resolution and also works with FaceTime. It's located in the top left corner on the back of the iPad 2.